Our zeal for exceptional quality and workmanship knows no limits. Whether it’s design, materials or processes, a sense of who we are compels us to explore all the options and solutions, and create new ones, too. We fine-tune, we overanalyze, we design and re-design, not because we have to, but because it’s we are committed to quality assurance and providing the best quality products to our customers. 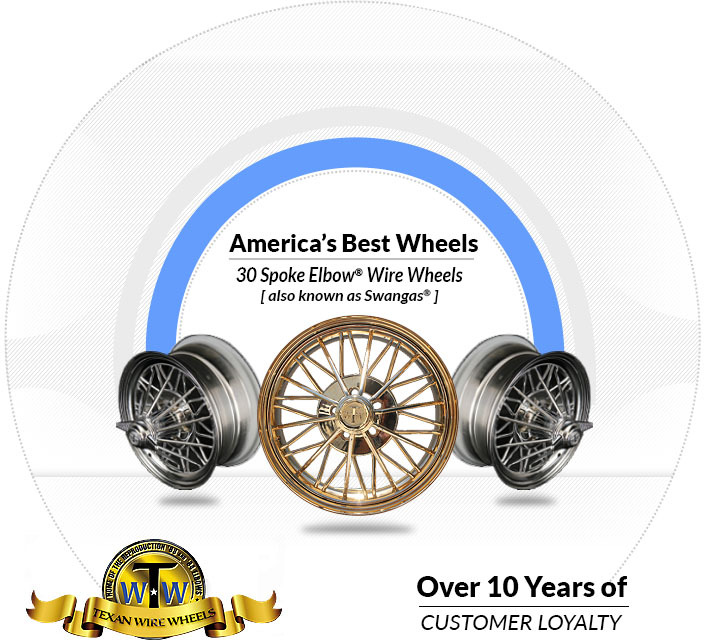 Creating the Swangas® experience entails more than wheel performance. It’s also about your connection with your Swangas®, and how it makes you feel, both emotionally and physically. Designing and building cutting-edge technology into every 30 Spoke Elbow® Wire Wheel helps us offer you the best wire wheels for cars and trucks — from wheel size to amount of wheel poke, to gold and chrome finishes, style and fitment. Our spoke wire wheels are as much about making a statement as they are about getting you to your destination. Cruise in a custom set of vintage 83s® or 84® 30 spoke wire wheels that everyone will envy. From chrome to gold, from 15 inch to 22 inch, we manufacture gorgeous aftermarket custom spoke wire wheels. Texan Wire Wheels is the best place to buy wire wheels online.